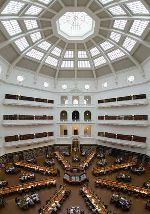 This entry was posted in Uncategorized and tagged architecture, books, libraries, State Library of Victoria by suesbent. Bookmark the permalink. What a very lovely post about the institution at which I work – and particularly the plugs for insideadog and ergo, which come out of the Learning area for which I’m responsible! Thanks for your comment Andrew. How lucky you are to work there. It must instill you with a seep sense of pride. Opps! Make that “deep” sense of pride.